Oakland voters, as with voters throughout the Bay Area and the nation, will have quite a slew of decisions to make on November 8. KK is one of the easiest. Oakland’s Measure KK will provide much needed funds to pave our streets and fix our sidewalks. Imagine walking, biking, and even driving around Oakland without hitting potholes or broken sidewalks on every other block. Safe-streets advocacy groups are in near unanimity in support of KK, with Transform, Walk Oakland Bike Oakland, Bike East Bay, and SPUR among the thirty or so groups officially endorsing it. The bond also earmarks $150 million to upgrade city facilities, such as libraries, parks, and fire stations. Lastly, it has a strong equity component: it includes $100 million for affordable housing. Readers will recall that Jeff Tumlin, Principal and Director of Strategy at Nelson\Nygaard Consulting, was hired this summer by Oakland to help reorganize city government. He has until early next year to put together a Transportation Department, whereas until now various tasks relating to transportation were split among planning and public works departments. Tumlin is designing a DOT that will be project-oriented, so that safe streets will get built. “The Oakland DOT will be different. All pavement maintenance will go into the DOT, instead of Public Works like in San Francisco or Berkeley. 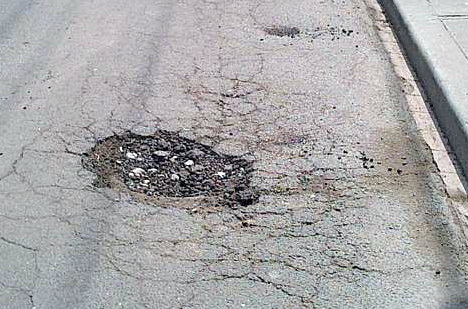 The DOT will be in charge of everything about the streets, with the exception of sewers,” he told Streetsblog this summer. But it will all be meaningless without money. “Every day we get well-meaning requests from citizens to address stop signs or street lights that are out, or traffic-calming requests. We have about one-tenth of the resources that we need to address all of these requests,” he said. But if it gets funding, can Oakland reform its car-focused planning of the past? Streetsblog readers aren’t going to want to fork over more of their hard-earned paychecks to fund street work, if all it means is smooth pavement and more auto-uber-alles policies. General obligation bonds, after all, are a tax mechanism. The bonds will be paid by a property tax assessment, adding about $60 to the annual property tax bill of a home valued at $250,000–the median in Oakland–according to calculations by the SF Chronicle, which endorsed the measure. It’s easy to be skeptical–and downright cynical–about taxes and how they get spent. And Oakland hasn’t proven itself yet. Streetsblog toured the recently repaved streets near Jack London Square and was flummoxed to see freshly painted bike lanes in door, a.k.a. “death,” zones. On top of being too close to parked cars, the lanes are blocked by pallets, cars, and delivery trucks, some even putting cones out to advertise their transgression. This is all happening on streets that could have had parking-protected bike lanes. It seems like a huge missed opportunity. It also smacks of agencies still working at cross purposes and following outdated rules, which is what Tumlin and the new DOT will have to shift. There are some signs that it’s beginning to happen. The protected bike lanes on Telegraph–and their planned extension toward Temescal–and the bus-only lanes/BRT planned for International Boulevard come to mind. 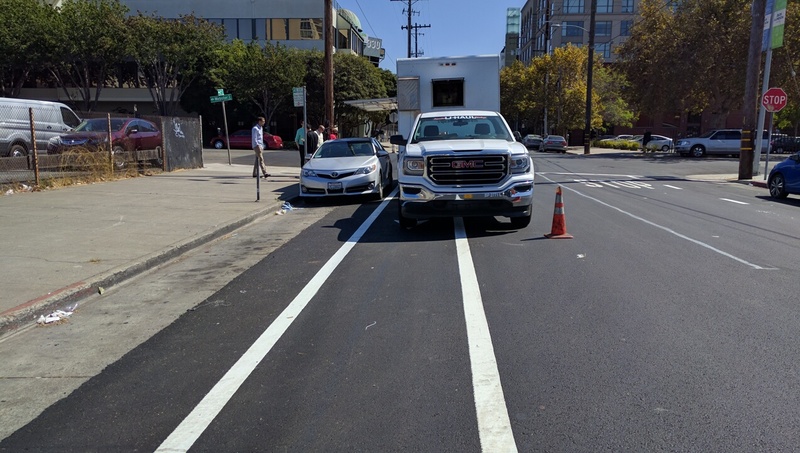 City staff has also been adding bike lanes when the opportunity presents itself–see Bike East Bay’s celebration of Oakland’s “bonus bike lanes” that are going in, one by one, all over town. And that’s why it’s essential to get Oakland’s streets and sidewalks repaired. 85 years is too long to fix a street. KK is a general obligation bond and will require two-thirds to pass. Streetsblog San Francisco urges its Oakland readers to vote “yes” on KK. Thanks for your support of this very important measure, Roger and Melanie! With regard to the new bike lanes on 2nd Street in Jack London Square though, that is actually one project where we should be providing staff with kudos not criticism. This was previously a sharrow street, which staff elected to upgrade to bike lanes by narrowing the travel lanes as part of a routine paving project. Of course a better solution would be more physical traffic calming, but this would not have been possible within the paving project budget. The Oakland bike plan did not mandate bike lanes on 2nd but the additional visual cues do help to calm traffic speeds and encourage drivers to look out for bike riders, compared to sharrows and wider lanes, so I consider it an improvement and appreciate that staff did not just repave and restripe with no changes. The narrowness of the street and the existing produce market use between Broadway and Webster makes a useable protected bikeway extremely tough to implement. The best future solution will probably involve routing the bikeway to a different parallel street with a protected facility or significant traffic calming, as opposed to expecting all the existing uses to change. If we are looking for missed opportunities in the past due to the lack of a DOT, a better example is southbound San Pablo Ave south of 20th Street. The city recently redesigned and repaved San Pablo from there down to 17th Street, and although some bike lane gaps were addressed in the northbound direction the existing sharrows were just repainted southbound. I was told by staff that they knew the two southbound travel lanes were not needed, but they replaced them anyway because a traffic study to justify a road diet was not coordinated in time for that project implementation. I think it’s a really confusing cue to drivers. The city’s standards for what to paint, and where to paint it, should be clarified. The one at 17th/Webster was an error on the part of the contractor. The city is aware of it and tried to get them to fix it but the contractor responsible for the striping never followed up. Instead the city is issuing another work order to get that and a few other striping errors addressed soon, but it’s already been two years since the original job was closed out. I noticed another similar issue with the bike lane about to be striped at Madison/13th and reported it to the city, so they will be addressing the error before the lane is striped. However, if you see any other bike lane omissions or obvious errors around town please make sure to report them via the SeeClickFix app or website. This also shows why it is useful for the city to do more striping work in-house, as opposed to shopping stuff out to contractors who are cheaper but less reliable. This is already part of the conversation surrounding the new Oakland Department of Transportation development. KK is a money grab to cover up bad fund management by the council. They need to fix the waste and pension underfunding first. Then, if they needs funds they need a measure for each with funds dedicated to one use, not multiple, and with oversight so funds cannot be mismanaged. Why does Measure KK include any money for “affordable housing”? This dilutes the measure, and it will likely be a turn off for voters who realize that “affordable housing” does little if anything to actually make a difference in housing prices for anyone. Plus Measure A1 deals with affordable housing too. Why would voters choose to tax themselves twice for the same thing? A1 is a county bond whereas KK is Oakland-specific (about $100M of the $600M total going to housing programs and projects). The city funding is important because a “local match” is often required in order to access regional, state, and federal funds, or at least to make grant applications more competitive. By having local KK funding available the city will be better situated to get a bigger piece of that pie. I think the idea with KK is that both housing and transportation are related issues when it comes to displacement. By including both via one funding source projects can be evaluated as to how they address both goals simultaneously, for the biggest impact of livability.